A businessman walks on the defined path, but an entrepreneur believes in making his own path, which becomes a guideline for other businessmen. Most of the people have a misconception that the terms businessman and entrepreneur, carry the same meaning, due to which they use them interchangeably. A businessman is a person who runs the business, undertaking an unoriginal business idea. On the contrary, an entrepreneur is someone who first initiates a product or business idea and thus the leader of that in the market. In the long run, an entrepreneur becomes a businessman, but there is a difference. Even the terms will sound same for a layman, but there is a fine line amidst the two, in the sense that an entrepreneur is always a market leader whereas a businessman is a market player. In this article, we will help you learn the difference between businessman and entrepreneur. In economics, the entrepreneur is considered as the most important factor of production, which assembles and mobilizes the other three factors of production i.e. land, labor and capital. In the long run, these entrepreneurs become a businessman. Some real life examples of such entrepreneurs are Bill Gates (founder of Microsoft), Mark Zuckerberg (co-founder of Facebook), Larry Page (co-founder of Google), Steve Jobs (co-founder of Apple) etc. 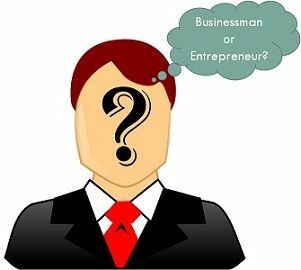 A person who brings his unique idea to run a startup company is known as an entrepreneur. A businessman is a person who starts a business on an old concept or idea. A businessman is a businessman, but an entrepreneur is an entrepreneur, an organizer, a risk taker, a manager at the same time. The former focuses on competition, but the latter gives emphasis on coordination and cooperation of all the resources. Thanks a lot. These are very useful to me personally for my work as Business Counselor. I greatly appreciate your sharing these quite informative/educational articles. This is educational, inspirational and great. Thank You Very Much for the amazing article! I am still figuring out to become an Entrepreneur or a Businessman. Thank you for this goldmine of information. I could use some of these information for my career presentation. very clear definition, thanks for sharing. Great read ! This article is such a big help ! Is Mark zuckerburk co founder of Facebook???? Wow, great man. It’s awesome post ever I seen. Great information’s ! thanks for sharing with us . wow! now i know! i can share this in my radio prog. thank you and more power!